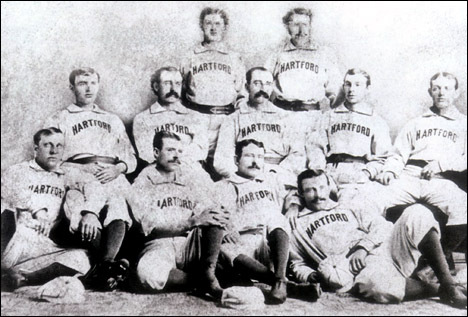 The Dark Blues were one of the charter members of the National League in 1876 but due to poor attendance they packed up and moved to Brooklyn to become the Brooklyn Hartfords in 1877. They folded the following year. Below is some information about the park by baseball historian and author David Arcidiacono. "When the Hartford Dark Blues were first organized in 1874, club officers considered several sites for the Hartford Base Ball Grounds. The majority of officers favored land on the Colt property south of downtown, even though it wasn't on the main transportation routes. Believing that special trains could run on game days to compensate for this, the club selected the Colt lot which lay at the corner of Wyllys and Hendrixon Avenues. 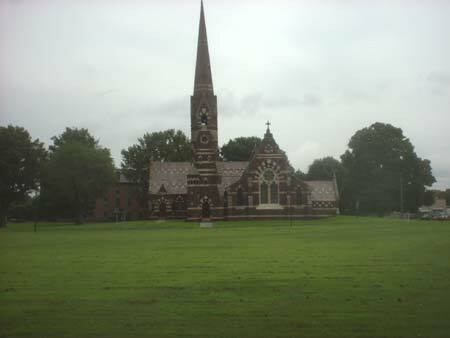 The park's closest neighbor was the Church of the Good Shepherd, an imposing structure built by Mrs. Samuel Colt as a memorial to her famous husband and four children, three of whom died in infancy. The church still stands today, but Hendrixon Avenue no longer exists and Wyllys Avenue has been reconfigured and no longer runs directly in front of the church. In the 1870's, Hendrixon Avenue ran past third base. The diamond was set up facing south, with Hendrixon Avenue running past third base, meaning in the late afternoon the sun shone directly in the batters' eyes. When Morgan Bulkeley became president of the Dark Blues in 1875 he was intent on going first class all the way. As a result the grounds were totally refurbished in beautiful fashion. The old pavilion behind home plate was replaced by a larger one with seating for 800 spectators. The seats were tiered and could be reached by way of a broad staircase leading from the main entrance on Wyllys Avenue directly into the pavilion. Above the stands, on the pavilion's roof, was a domed tower where scorers, a telegraph operator, and one reporter from each city paper could sit. Capping the tower was a flag pole from which the national colors proudly flew. Underneath the pavilion were "two roomy club rooms, one for use by Hartford club, and the other for visiting club." These were entered by use of doors at either end of the pavilion. Behind the club rooms was a long storeroom for ball and bats. Pavilion roof supports were limited to eight so as not to obstruct the view of those seated in the pavilion. John Mead was the architect. Tiered seating stretched down the first and third base lines with room for carriages beyond the outfield. Crowds for the Dark Blues biggest games reached 8,000 to 10,000 strong. Some baseball reference books claim that there were trees in the outfield, in front of the fence and in play. 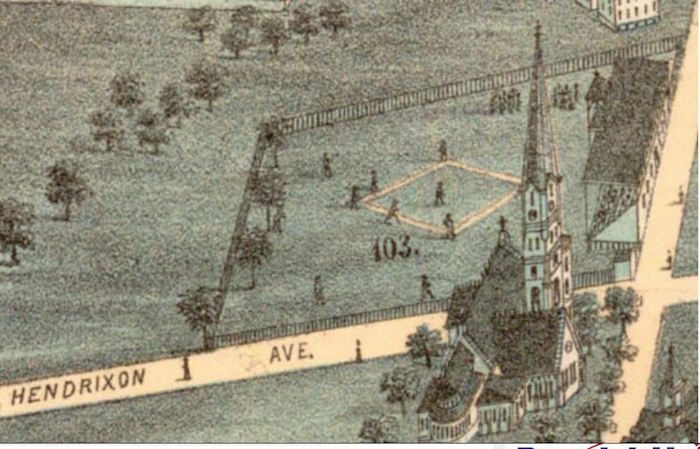 This is undoubtedly based on a bird's eye view drawing of the neighborhood created by Oakley H. Bailey in 1877 which revealed three trees in the outfield, one in center, left and right. Further research has not been able to corroborate the existence of these trees. Newspapers o the day make frequent mention of the trees located adjacent to the field, which boys would climb to get a free view of the game, however no mention of trees in the field have been found." This information was provided by David Arcidiacono of East Hampton, Connecticut. Mr. Arcidiacono is the author of Middletown's Season In The Sun - The Story of Connecticut's First Professional Baseball Team and Grace, Grit, and Growling: The Hartford Dark Blues Base Ball Club 1874-1877. Both books can be purchased at the Vintage Baseball Factory website (www.vbbf.com) or through the author, who can be contacted at DArcidiacono@SNET.NET. © 2002-17 Paul Healey except where noted.